The importance of using a plasma cleaning system that generates oxygen radicals (OR) is mentioned in the research below. 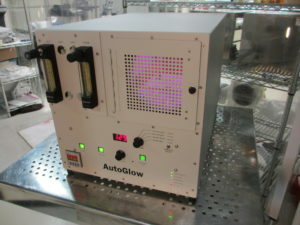 Contact Glow Research for more details on systems that fit this requirement. Oxygen radicals (ORs) are highly efficient for in situ cleaning of organic contaminants from the interior of vacuum systems and sample surfaces . ORs decompose organics into gasses (H2O, CO, which are evacuated from the system. This phenomenon has been used to devise surface cleaning methods for a diverse range of materials. However, the application of OR cleaning to graphite and carbon nanotubes (CNTs) is not straightforward, as O plasma is known to ash both forms of carbon. This work  demonstrates a successful OR cleaning of surface organic contaminants (most likely hydrocarbons from the air), as well as chemical residue from the fabrication process, without inducing microstructural changes visible by SEM. Fig. 2 demonstrates the cleaning of organic surface contaminants, such as hydrocarbons from the air. Charged by the electron beam, they retain the imprint of the area scanned during prior SEM imaging. Three such typical rectangular shapes are visible in the “before” image (corners marked with arrows), and none are present in the “after” image. The charging at the edges of the C filaments in all “after” images is also reduced due to the removed hydrocarbon. Next, Fig. 3 shows the removal of chemical residue (dark spot) from the purification process. Although 1000 s were not sufficient to entirely eliminate the residue, the majority of it has been cleaned. For use in CNT fabrication, it is important to demonstrate that OR cleaning is non-destructive. To this end, a large number of high magnification SEM images were used (example: Fig. 4). None of them contained evidence of structural degradation, as that expected from energetic O plasma etching. This implies that OR cleaning appears to have no drawbacks relevant to CNT processing. Ongoing work is aimed at obtaining a conclusive confirmation by TEM and/or experiments with CNT devices. In regard to CNT electronics, OR cleaning yields higher quality SEM images by removing surface contaminants. More importantly, the present results can have a significant impact on metal-to-CNT contact deposition processes, which are difficult to replicate for reasons that can be attributed to surface contaminants. Further investigation is in progress. 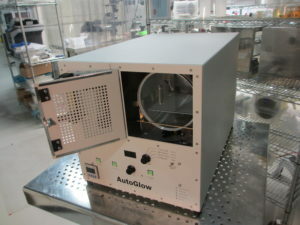 AutoGlow Operation Instructions at Cal. Tech.